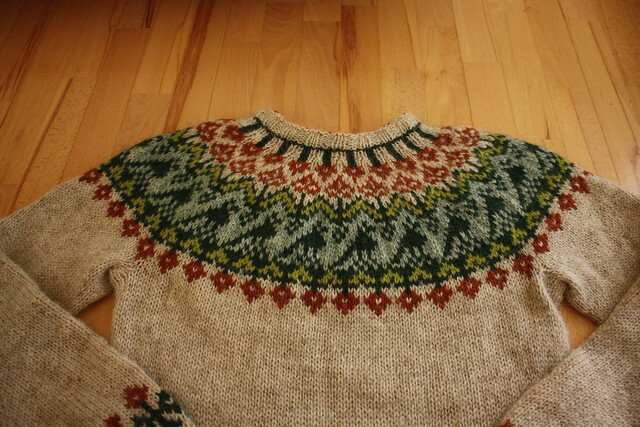 I have finally finished the lopapeysa I was working on for the KAL of the Spanish Swap (group on Ravelry). * Pattern: I made it myself! Yes, my first one! * Yarn: Plötulopi (double strand). * Needles: 4.5mm for the ribbing ad 5.5 for the rest. 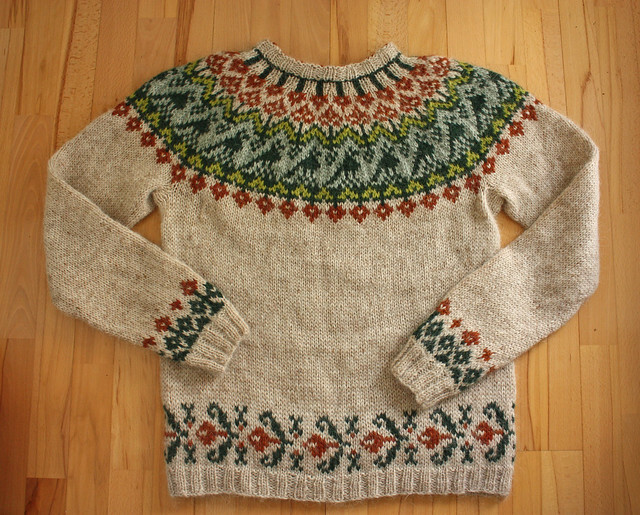 * When I started to knit this lopapeysa I wasn't sure about how it was going to end... at all. The first thing I did was to work the waist pattern which I decided not to use in the arms because it was a little bit to big... so I designed a second pattern for the sleeves. * The whole thing was turning very "flowery". My first idea for the yoke was to make a pattern using the traditional eight points star (or rose) and then some more flowers... but changed my mind and I went for birds (instead of even more flowers). * I thought that birds and flowers could be a very nice (and somehow logical) combination. So, the birds gave the name to the pattern: ÞRÖSTUR, which means thrush or tordo in spanish. I have always thought that I have ever had to take an icelandic name for myself it would be Þröstur! * While I was knitting the yoke I wasn't sure wether I was liking it or not (in terms of the colors, especially the lime green, and the pattern itself). I had a lot of doubts about how the whole thing was going to turn out. The yoke was pretty much designed on the run... while knitting. * I am very satisfied with the whole thing. I am really looking forward to trying to design again! ** Pictures of me wearing it soon!! Te quedó muy muy padre! El diseño y colores del yoke me encantó. Felicidades por tu primer diseño!! It is truly beautiful. Well done. The pattern and the colours are fantastic. So fresh and modern. And the pattern will be available when....? Precioso, me encantan los dibujos y la combinación de colores que le has puesto. :o :o :o ha quedado precioso me encantan los colores que has usado el diseño de las flores y para colmo el tordo, me apunto a la espera del patrón FELICIDADES !!!!!!!!!!!! competition. :-)You have such an eye for colors and what is right and your experience with shawls,lopapeysas,hats, mittens, or whatever just enhances that. Whew. Now that I have my breath back, I want to say I am glad you told what the name means - saves me having to look it up. :-) I think you should be very satisfied with it and I'm glad you are keeping it for yourself! Otra que se apunta a la lista de espera del patrón! Te ha quedado hermoso de verdad, me encantan los detalles de flores en los puños, y el yoke... todo el conjunto es una maravilla! es un diseño precioso Rodri!! felicitaciones!! Increible! realmente es precioso...me encanta! Es precioso; me gusta todo, los colores, la realización y, sobre todo, el diseño. Felicidades!!! I am very, very happy it! It was very interesting to make a design and see how it developed while I was knitting it. I still have to figure out how to write a proper pattern for it. ¡Estoy muy contento con el resultado final! Ha sido una experiencia interesante el haber diseñado un patrón y luego ver cómo se desarrollaba mientras lo iba tejiendo. Todavía tengo que ver cómo lo hago para escribir el patrón correctamente. What tool are you using for writing a propper pattern? I´m working on a lace pattern (I just started, it is far from being finished) and I found out that good old MS Excel works best for me. I found some online knitting chart makers but Excel is Excel. 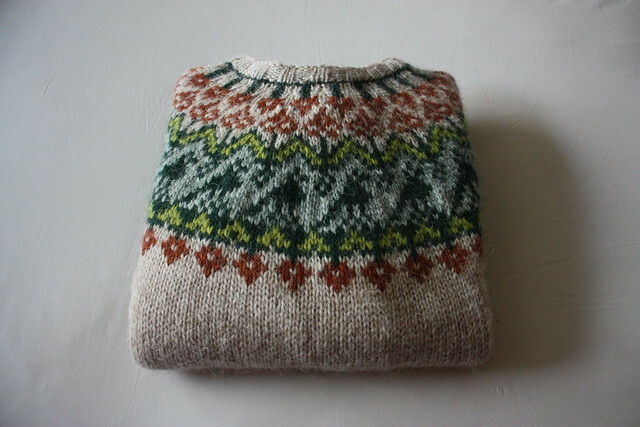 Beautifully knt sweater. The design is lovely and the shawl is gorgeous. I really enjoy your blog. Very nice combination of colors! You are very talented knitter!